Let's break it down a bit...first let's just talk about the book in it's physical form. Just shy of square, the book is 8-inches wide x 9-inches tall and 208 pages. The pages are a semi-gloss and almost every recipe is accompanied by a full color, drop dead gorgeous photos. The binding is strong and sturdy, and lays flat when opened, which is helpful considering how much use it's gonna get in the kitchen! I love them. The recipes are well laid out and easy to read. The fonts are, dare I say, even a little punk rock? The book kicks it off with a sweet dedication, "For the Animals, Always." Which, gawdamm, brought a tear to my eye. Then a quick introduction and guide to the recipe icons in the book (recipes are labeled if they are gluten-free, soy-free, oil-free, or in a hurry) and then she' starts right in on the recipes. The recipes in this book are elevated vegetable based dishes that are packed with a depth of flavor, layers of depth, really. Respectfully inspired by world cuisines, the recipes combine spices and texture in a way I haven't seen done before in a vegan cookbook. Celine isn't veganizing here. She is creating some really beautiful and flavorful dishes. Harissa, miso, sesame, chilies, ginger, homemade pomegranate molasses, and maca are just a few of the bold flavor components you will find here. I highly recommend this book to any flavor lover. Vegan or not. I also recommend this book to seasoned, experienced vegans, who are looking to take their flavor game up a notch. Seriously! This is all new stuff here. Some excellent techniques, and really great recipes that will impress anyone you cook them for. But you don't have to take my word for it...Celine was kind enough to share one of the recipes with you so you can taste it for yourself! 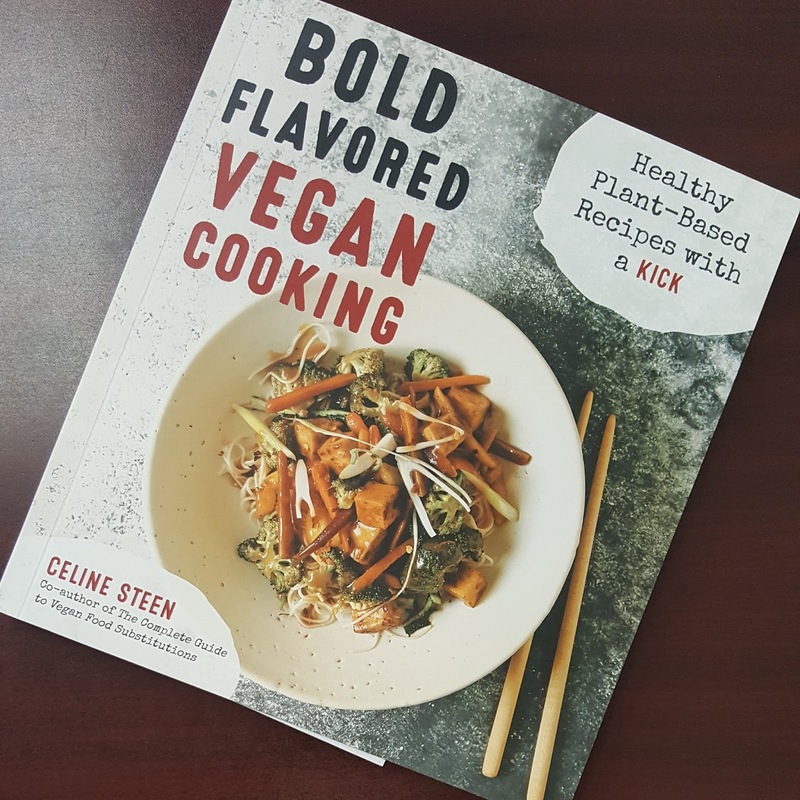 Bold Flavored Vegan Cooking by Celine Steen. 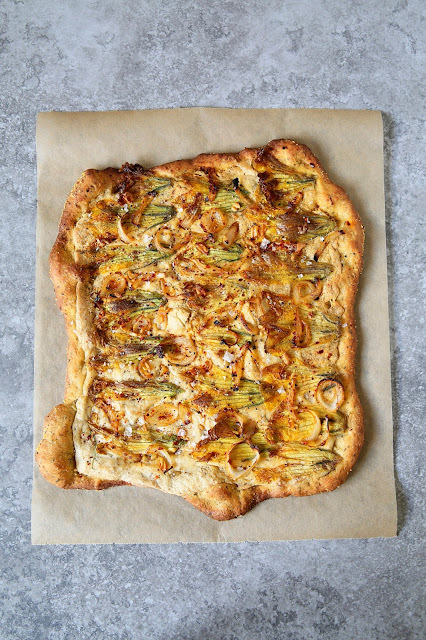 This is a deliciously savory pizza made gorgeous with the use of squash blossoms. If you cannot find any at the market, replace them with any zucchini or summer squash of choice, thinly sliced into rounds. You will need approximately 1 large squash or 2 smaller to cover the surface; have extra handy just in case. I could see adding minced fresh rosemary, thyme, oregano or parsley on top of this. The sturdier herbs can be baked, while parsley would be best added only upon serving. Place the oil, onion, garlic and pepper flakes in a small saucepan. Heat on medium-low heat, then lower the heat once the bulky ingredients start to sizzle slightly. Cook on low heat for 5 minutes until fragrant and the onion becomes translucent. Remove from the heat, add the saffron threads (if using) and infuse for 1 hour. Mince the garlic and set aside. Drain and rinse the cashews. Place the coconut milk, tofu, cashews, lemon juice, salt and nutritional yeast in a food processor or high-speed blender. Process until smooth. Add the chia seeds and process a few times until slightly thicker. Set aside. Preheat the oven to 450°F (232°C, or gas mark 8). Place a thin layer of cornmeal on a large baking sheet. Roll out the pizza dough as thin as you can into a rectangle, approximately 11 x 14 inches (28 x 36 cm). Lightly brush the whole surface with infused oil, including the edges. There will be leftovers of the oil, which can be used to stir-fry veggies or to flavor pasta or other grains. Store covered in the refrigerator for up to 1 week. Top with a layer (not too thick) of cashew preparation. There will be leftovers, which can be used on a future pizza within a week. Store in an airtight container in the refrigerator. Evenly place the halved squash blossoms on the surface. Top with the minced garlic and with onion slices scooped out from the infused oil with a fork. Bake until golden brown, about 16 minutes. Top with ground pepper, salt and extra Aleppo pepper flakes to taste. Serve immediately.